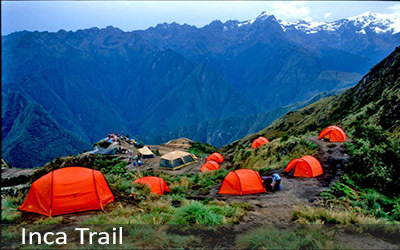 Today, very early in the morning, you will start the mighty Inca Trail. Your private Inca Trail Tour Guide and driver will pick you up from your hotel to take you to KM82, one hour from Ollantaytambo. 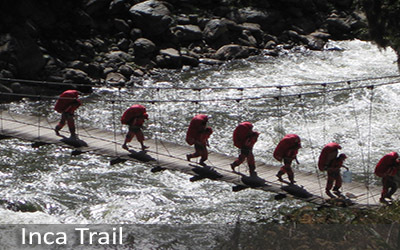 Here you will register and meet your chef and porters who will accompany you for the whole duration of the trek. 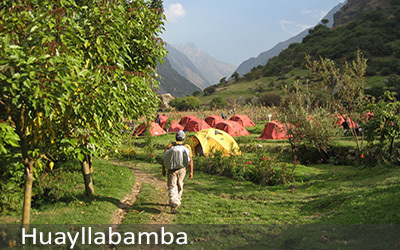 From KM82 (2700m, 8850ft) you will make your way to the Wayllabamba Campsite. The first two hours of the trek is a lightly paced climb until you reach Miskay, a beautiful picnic area where your chef and porters will have lunch ready and waiting. After lunch, you will have 3-4 hours (depending on pace) of steady uphill climbing. 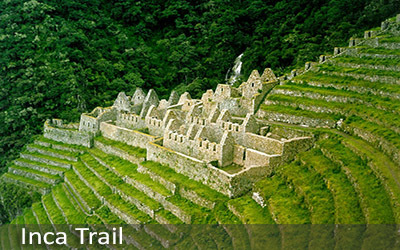 Along the way, you will have a stunning view overlooking the first Incan ruins of the trail,Llactapata, which is a site thought to have been used primarily for agricultural production. Here, you will have a great opportunity to stop and take some photos and learn about the history. At the end of the day, you will arrive at the village of Wayllabamba,and the chef and porters will reward you by having your tent set up and your dinner waiting for you. You will have the rest of the night to relax. Early in the morning, you will be awoken with a hot coca tea. You will enjoy a tasty breakfast to get ready for the challenging, yet rewarding, day ahead. Today, you will start from an altitude of 3000m, 9850ft and climb for five hours to reach an altitude of 4200m, 13800ft at Dead Woman’s Pass, the highest point of the trail, where you will have a stunning panoramic view of the Andean mountains and its surroundings. 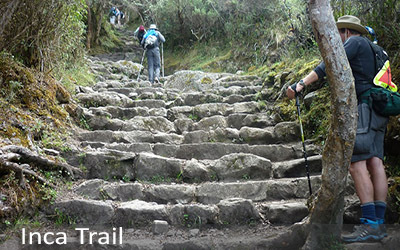 After completing the toughest part of the Inca Trail, you have an hour descent before reaching the picnic area where your chef and porters will have prepared lunch. After lunch, you have another hour descent before reaching Pacaymayo Campsite, where you have the rest of the day to relax. During the evening, you will enjoy a delicious dinner cooked by the chef before having some more well deserved time to relax. 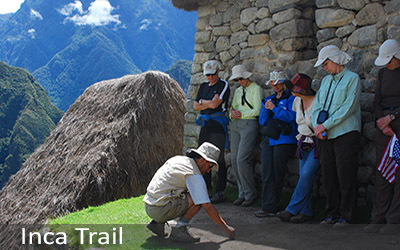 After an early breakfast, you will continue trekking the Inca Trail past many archeological sites. The first part of today’s trek will take you from Pacaymayo (3600m, 11800ft) to the second pass, Runkuracay (3900m, 12800ft), where, along the way, you will enter the beautiful circular walled ruin that was thought to have been a stable resting place for couriers and their animals on the trial. 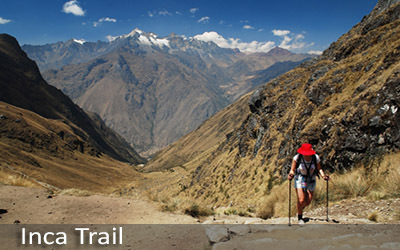 From here, you will also have a stunning view of the surrounding mountains, including Salkantay and Veronika. After reaching this pass, the rest of the day’s trekking is mostly downhill, following the amazing original path constructed during the Incan period and passing through original tunnels that continue to stand. You will pass Saqaymarca, an inaccessible old Incan town that sits on top of a sheer cliff, before reaching a nice area for lunch. After Saqaymarca, you will encounter the beautiful ruins of Phuyupatamarca, which was believed to have been an important religious site that contained sacred baths for ceremonial purposes. 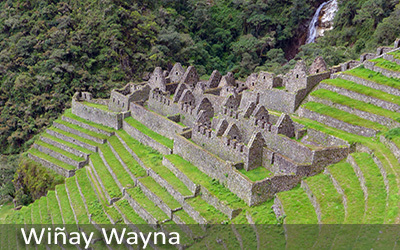 After lunch, we will continue the trek until we reach the agricultural terraces and campsite of WiñayWayna. From the campsite, you will have a spectacular view of the snow-capped mountains and you will have the rest of the day to relax and take in the stunning view. During the evening, the chef will prepare you a special dinner. 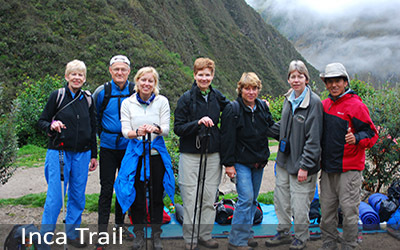 You will awake to another early breakfast to prepare for the last leg of the Inca Trail. 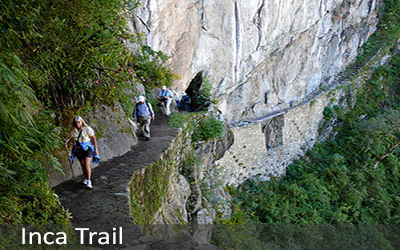 From Wiñay Wayna you will trek for two hours until you reach the Sun Gate, ‘Inti Punku’, where you finally arrived at Machu Picchu. Congratulations, you will have officially completed the Inca Trail and be rewarded with a breathtaking view of Machu Picchu, ‘The Lost City of the Incas!’ From this spectacular view, you will overlook the entire site of Machu Picchu and the beautiful mountain of Wayna Picchu. You will then have a short downhill walk to the ruins and enjoy a guided tour to learn about the history of this truly fascinating sacred Incan site. You can then enjoy some free time to explore the site on your ownbefore returning to Aguas Calientes in time for an exquisite lunch and then take the train back to Ollantaytambo. Upon arrival, we will transfer you to your hotel. The campsite is at 3,000 meters above sea level and one can feel the cold at night. Here you will relax accompanied by the only sound of the place, birds and the wind, and will be able to enjoy the beautiful view of the valley and the Veronica Peak. After dinner, and before going to bed, gazing at the stars will provide grand scenery. Also at high altitude, here you will enjoy of a chilly night on a site that has spectacular views to offer. Rest in your personal tent and enjoy the lavish dishes your cook will prepare for you. 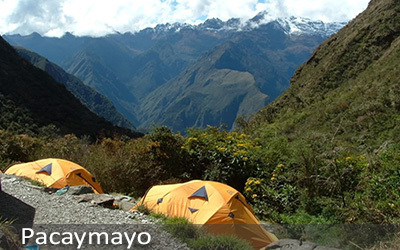 From Winaywayna, the last camping site before reaching Machu Picchu, you will be granted an exceptional view of the ruins of Intipata and its agricultural terraces from above. It is the perfect place to soak in Incan architecture before diving into Machu Picchu the next day.